Sevagram 442 102 (Wardha) M. S.
Antigen assay is a better indicator of active infection than antibody detection hence affinity purified anti ES-31 antibody against Mycobacterium tuberculosis H37Ra Excretory-Secretory 31kDa serine protease antigen (SEVA TB ES-31) was explored for detection of circulating free and Immune-Complexed (IC) ES-31 antigen by microtitre plate Peroxidase sandwich ELISA. The assay was evaluated in 27 clinical sera of sputum acid fast bacilli (AFB) positive and 10 AFB negative but anti-tuberculosis therapy responded pulmonary tuberculosis patients in a tertiary hospital and 20 normal sera as control. The assay for circulating free ES-31 antigen in this preliminary study showed a sensitivity of 74% for AFB positive cases and 70% for AFB negative cases with 90% specificity. The assay for IC ES-31 antigen showed sensitivity of 77% for AFB positive and 70% for AFB negative cases with 90% specificity. Detection of IC-antigen as adjunct assay improves the sensitivity of detection. Peroxidase enzyme immuno assay showed a sensitivity of detection of 0.5 μg/ ml and levels of free and IC ES-31 antigens were 0.71 ± 0.64 and 0.82 ± 0.40 μg/ ml in AFB positive patients’ sera. Tuberculosis (TB) is re-emerging as a deadly disease affecting both developing and developed countries. Based on surveillance and survey data, WHO estimated that 9.2 million new cases of TB occurred in 2006, including 4.1 million new smear-positive cases. India, China, Indonesia, South Africa and Nigeria rank first to fifth in terms of incident cases. Among these new cases around 7.7% were HIV-positive . Excessive delays in correct TB diagnosis and treatment remain a weakness of the control strategy [2-4]. Such delays are critical as infectious individuals provide more opportunities for transmission of the disease. In a developing country there are number of factors potentially increasing total diagnostic time, such as particularly the low sensitivity of the initial sputum smear microscopy test for acid-fast bacilli (AFB), lack of adequate laboratory facilities, lack of screening assays for active TB, time consuming (6 weeks) culture method [5,6]. Misdiagnosis due to less specific tests leading to failure to treat a serious infection or wasting expensive treatment on people who are not infected remains a serious problem . Hence, there is an urgent need for improved and easily accessible diagnostic methods that are simple, rapid, inexpensive, reliable and suitable for use in the developing world. Antigen assay will be a better marker than antibody detection for indication of presence of bacilli and active infection. Many groups have explored culture filtrate antigen of Mycobacterium tuberculosis (M.tb.) in ELISA for serodiagnosis of TB. [8, 9] In earlier studies from our laboratory, we have reported isolation of SEVA TB ES-31 (ES-31) protein antigen from culture filtrate of M.tb. H37Ra. ES-31 antigen was isolated using salt precipitation, sodium dodecyl sulphate-polyacrylamide gel electrophoresis (SDS-PAGE) and fast protein liquid chromatography (FPLC) fractionation and alternately by affinity chromatography [10, 11]. ES-31 antigen was shown to be diagnostically useful in TB . The detection of circulating free antigen (Ag) and circulating immune-complexed antigen (IC-Ag) using affinity purified anti ES- 31 antibody was found to be useful as an adjunct test in TB serum showing absence of antituberculosis antibody by Penicillinase ELISA . Combinatorial use of antibodies in antigen detection showed improved sensitivity and was observed to be better than single antibody . Detection of free and IC tuberculous serine protease antigen along with antibody by Penicillinase ELISA was found to be useful for detecting TB in the presence of HIV-TB co-infection . Immunomonitoring for the presence of antigen in TB patients under anti-tuberculosis therapy (ATT) showed that ES-31 antigen assay is useful in determining the effectiveness of therapy and patients’ compliance. A decrease in ES-31 antigen level was observed with treatment . All these assays were based on penicillinase ELISA, which is sensitive but semi-quantitative and subjective assay. In this preliminary study, mass screening suitable, user friendly microtitre plate Peroxidase sandwich ELISA was standardized using affinity purified anti ES-31 antibody against ES-31 protein antigen for detection and quantitation of circulating free and IC ES-31 antigen. Sera samples were received from patients (n = 37) attending tertiary hospital of this Medical Institute suspected of having pulmonary TB (PTB) for in house developed Penicillinase enzyme immunoassay, ‘SEVA TB ELISA’ for screening against tuberculosis. Clinical history, physical examination, baseline laboratory investigations [hemogram, tuberculin skin test, chest skigram, urinanalysis), microbiological (AFB smear and culture)] investigations or response to ATT were considered as the basis for confirmation of TB etiology. 27 sera belonged to AFB positive group and 10 belonged to AFB negative group, which were diagnosed clinically and responding to ATT. Sera samples from healthy individuals (n=20) with no history of TB were served as healthy controls. Sera samples were stored at our center’s patient sera bank in 0.5 ml aliquots at -20 °C with 0.1% sodium azide until use. All cases included in this study had history of BCG vaccination. The study was done prospectively in blinded manner in which clinical diagnosis was not available to the laboratory personnel prior to the assay. In the present study, each serum sample had been assayed in duplicate. ES-31 antigen was isolated from M.tb. H37Ra ES antigen by affinity chromatography using anti ES-31 antibody coupled Sepharose-4B column (Pharmacia Biotechnology AB, Uppsala, Sweden) . Briefly, Cyanogen bromide-activated Sepharose 4B beads were coupled with purified anti ES-31 antibody. DSS antigen was passed through column and ES-31 antigen was eluted by glycine HCl buffer (0.01 mol/ L, pH2.5) and collected in Tris-HCl buffer (0.01M, pH8.6). M. tb. H37Ra detergent soluble sonicate (DSS) antigen, was prepared from M.tb. H37Ra bacilli. Briefly, bacilli were 5% phenol inactivated in 0.5M phosphate buffer (PBS, pH7.2) and incubated with sodium dodecyl suphate (SDS) extraction buffer. The supernatant as dialysed against 0.01M PBS, pH 7.2 and used as an antigen source . Anti-DSS IgG antibodies were raised in goat by immunizing intramuscularly with 500 μg protein/mL DSS antigen with 1 ml Freund’s incomplete adjuvant on days 0, 20, 33 and 45. Immune sera were collected on days 32, 44, 57, 60 and thereafter fortnightly and anti-SDS IgG was isolated by 33% saturation with ammonium sulphate under ice, followed by diethyl aminoethyl-cellulose ion exchange column chromatography as described earlier . Anti ES-31 antibodies were isolated from anti-DSS IgG by affinity chromatography using ES-31 antigen coupled Sepharose-4B column . The detection of circulating antigen using affinity purified anti ES-31 antibody was performed by Sandwich Plate anti ES-31 antibody was performed by Sandwich Plate were sensitized with optimally diluted concentration of anti ES-31 antibody 50 μg / 100μL/well in 0.06 M carbonate buffer pH9.6 overnight at 4 °C following by blocking with BSA 1% for 2 hours at 37°C. Plate was washed twice with PBS containing 0.05% Tween 20 (PBS/T) followed by addition of sera (dilution 1:50) in wells were exposed to 1:1000 diluted Goat anti ES-31 antibody IgG Peroxidase conjugate for 1 hour at 37°C. The wells were washed five times with PBS/T with 1 minute interval. The color was developed using TMB substrate (20X concentration) followed by using 50 μL stop solution (2N H2SO4). Then mean optical density at 450nm was read with ELISA reader. Peroxidase sandwich ELISA to obtain cutoff OD (Mean + 2SD) which was 0.180 (Figure 1). The assay for free ES-31 antigen showed a sensitivity of 74% for AFB positive cases and 70% for AFB negative cases with 90% specificity (Table 1). Free ES-31 antigen is sensitive to IC treatment resulting in loss of 64% of the antigenic activity and thus did not contribute significantly to IC-Ag level. The cutoff OD (Mean + 2SD) after screening control sera for IC-ES-31 antigen was 0.177 (Figure 2). The assay for IC-Ag showed sensitivity of 77% for AFB positive and 70% for AFB negative cases with 90% specificity (Table 1). Figure 1: Detection of circulating SEVA TB ES-31 antigen in sera by Peroxidase ELISA. The mean OD 450 obtainedwith sera of healthy individuals, plus 2SD, was used as the cutoff for positive reaction. 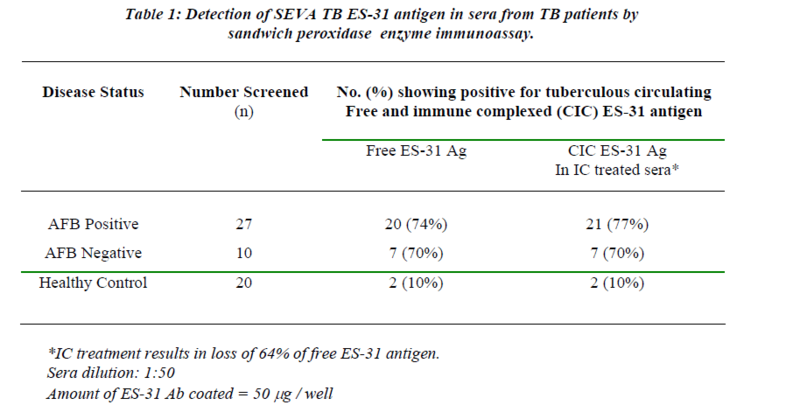 Figure 2: Detection of Immune complexed Seva TB ES-31 antigen in IC treated sera by Peroxidase ELISA. The mean OD 450 obtained with sera of healthy individuals, plus 2SD, was used as the cutoff for positive reaction..
Table 1: Detection of SEVA TB ES-31 antigen in sera from TB patients by sandwich peroxidase enzyme immunoassay. One of AFB positive sera and one of AFB negative sera did not show presence of IC Ag but showed the presence of free antigen, while two sera of AFB positive patients and one sera of AFB negative patients which were not showing presence of free antigen showed presence of IC-Ag .Thus detection of IC-Ag as adjunct assay improves the sensitivity of the detection. 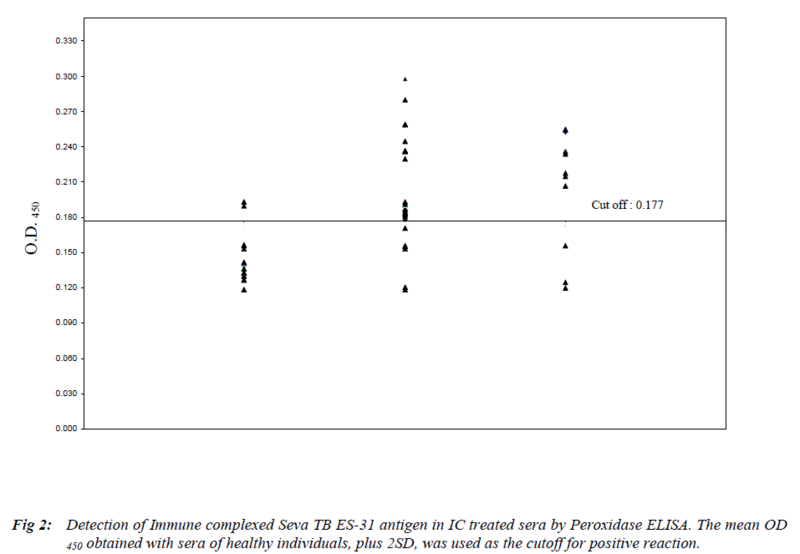 Figure 3 shows standard graph with purified ES-31 antigen at various concentrations (0.25, 0.1, 0.5, 1.0, 2.0, 4.0, 6.0, 8.0 and 10.0 ng/well) when assayed by using Peroxidase assay. Peroxidase assay showed a sensitivity of detection of 0.5 μg/ ml sera. However antigen concentration of less than 0.5μg/ ml did not show any significant O.D compared to control. The mean ± SD serum levels of free ES-31 antigen were 0.71 ± 0.64 and 0.82 ± 0.40 μg/ml in AFB positive and AFB negative TB sera respectively while serum levels of IC ES-31 antigen were 0.74 ± 0.65 and 0.60 ± 0.25 μg/ml in AFB positive and AFB negative TB sera respectively. 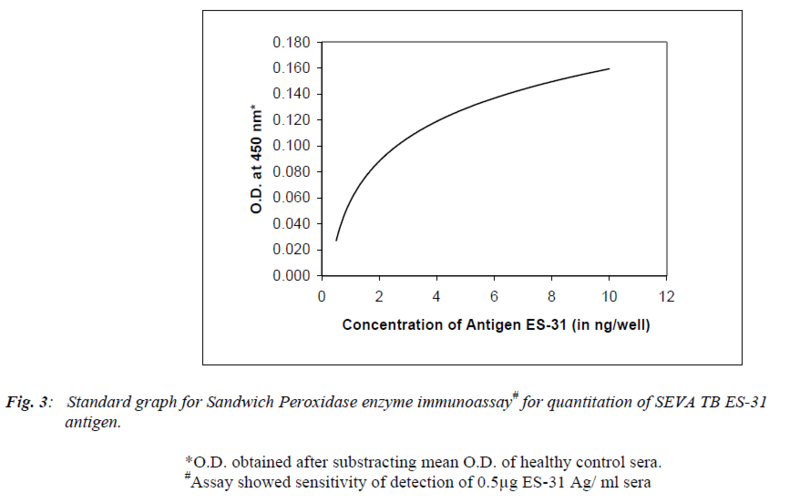 Figure 3: Standard graph for Sandwich Peroxidase enzyme immunoassay# for quantitation of SEVA TB ES-31 antigen. Antibody assay systems are being explored extensively for the serodiagnosis of tuberculosis [19,20]. Banerjee et al showed that detection of circulating free and IC ES-31 antigen using purified anti ES-31 antibody by penicillinase ELISA was useful as an adjunct test in TB serum showing absence of tuberculosis antibody . This is because Antigen assay is host immune system independent and will be a better marker for indication of presence of bacilli and active infection. Shende et al assessed penicillinase assay for circulating free and IC ES-31 antigen and its antibody in PTB cases of varying grades of sputum positivity . He found that levels of detectable anti ES-31 antibody was low due to removal of antibody from circulation by immune complex formation as confirmed by its elevated levels in sera of sputum AFB3+ PTB cases. This indicates that detection of free antigen and IC-treated antigen is better indicator of infection than antibody detection. The accurate and early detection of TB infection helps in the prompt initiation of drug treatment and better management of disease. In the present study, Microtitre Plate Peroxidase sandwich ELISA was explored by using affinity purified anti ES-31 antibody for detection of circulating antigen in tuberculosis sera. Construction of calibration curve (Figure 3) using ES-31 antigen allowed the tubercular antigen detected in human sera to be expressed quantitatively in terms of μg of ES-31 per ml sera. The assay showed a sensitivity of detection of 0.5 μg/ ml ES-31. 74% AFB positive sera, 70% AFB negative sera of PTB cases and 10% healthy control sera were positive for circulating free ES-31 antigen while 77% AFB positive sera, 70% AFB negative sera of PTB cases and 10% healthy control sera showed positive reaction for IC ES-31 antigen. It is of interest that Peroxidase ELISA could detect antigen in AFB negative but clinically diagnosed and ATT treated cases showing its usefulness in TB suspected cases. In AFB negative patients, though bacillemia is low, antigen level is significant, possibly due to 1. more antigen released by death of bacilli during treatment or 2. slow clearance of antigen in these patients. This needs further extensive study of clinically suspected and ATT responding TB cases. In earlier studies from this laboratory, anti ES-31 antibody had shown immunodiagnostic potential by penicillinase ELISA with sensitivity of 95% and specificity of 94.7% for detection of ES-31 antigen in PTB  indicating the decreased sensitivity of peroxidase assay. Penicillinase ELISA using 1μg of anti ES-31 antibody for detection of ES-31 antigen showed reactivity with 1:300 dilution of serum  while Peroxidase ELISA using 50μg of antibody showed reactivity with 1:50 dilution of serum. Hence Penicillinase ELISA is six fold sensitive than Peroxidase ELISA for detecting ES-31 antigen in serum. The higher sensitivity in penicillinase ELISA was possibly due to high turnover number of the enzyme and sensitive color reaction in this assay. Sauar et al  also reported the higher sensitivity of enzyme penicillinase compared to enzyme Peroxidase, alkaline phosphatase and beta galactosidase when used as labels for progesterone determination in milk by ELISA. Reddy et al  also found that stick penicillinase ELISA more sensitive than enzyme Peroxidase assay for detection of filarial antibody in sera. However peroxidase enzyme immunoassay is objective and user friendly. Thus in this communication, user friendly and more objective Peroxidase enzyme assay has been described for circulating ES-31 antigen detection independent of host immune response for diagnosis of PTB. Furthermore, detection of IC ES-31 antigen as an adjunct assay improves the sensitivity of diagnosis of PTB. This study was supported by a Tropical Disease Research grant from Kasturba Health Society, Sevagram. We thank Mr. D S Mehta, President of KHS and Dr. (Ms.) S Chhabra, Dean of MGIMS for their keen interest and encouragement for this study, Dr. Aamle, District Tuberculosis Officer and staff, Civil Hospital, Wardha, for cooperation. The technical assistance of Mrs. S Ingole and Mr. Sagar is appreciated. World health organization. Global tuberculosis control. WHO/CDS/TB/2008.19. Geneva, Switzerland: WHO, 2008. Asch S, Leake B, Anderson R, Gelberg L. Why do symptomatic patients delay obtaining care for tuberculosis? Am J Respir Crit Care Med 1998; 157: 1244-1248. Sherman LF, Fujiwara PI, Cook SV, Bazerman LB, et al. Patient and health care system delays in the diagnosis and treatment of tuberculosis. Int J Tuberc Lung Dis 1999; 3: 1088-1095. Wandwalo ER, Morkve O. Delay in tuberculosis case-finding and treatment in Mwanza, Tanzania. Int J Tuberc Lung Dis 2000; 4: 133-138. Millen SJ, Uys PW, Hargrove J, van Helden PD, Williams BG. The Effect of Diagnostic Delays on the Drop-Out Rate and the Total Delay to Diagnosis of Tuberculosis. PLoS ONE. 2008 Apr 9; 3(4):e1933. Peeling RW, Smith PG and Bossuyt PMM. A guide for diagnostic evaluations. Nat Rev Microbiol. 2006; 4: S2-6. Review. Nassau E, Parson ER, Johanson GD. The detection of antibodies to Mycobacterium tuberculosis by enzyme linked immunosorbant assay (ELISA). Tubercle 1976; 57: 67-70. Benjamin RG, Debanne SM, Ma Y, Daniel TB. Evaluation of Mycobacterial antigens in an enzyme linked immunosorbant assay (ELISA) for serodiagnosis of TB. J Med Microbiol 1984; 18: 309-318. Nair ER, Banerjee S, Kumar S, Reddy MVR, Harinath B C. Purification and characterization of a 31 kDa mycobacterial excretory-secretory antigenic protein with a diagnostic potential in pulmonary tuberculosis, Indian J Chest Dis Allied Sci, 2001; 43: 81-90. Nair ER, Banerjee S, Kumar S, Reddy MVR, Harinath B C. Isolation of Mycobacterium tuberculosis 31kDa antigen protein of diagnostic interest from culture filtrate using anti ES-31 antibody by affinity chromatography, Indian J Clin Biochem 2001; 16: 132-135. Gupta S, Shende N, Kumar S, Harinath BC. Antibody response to M. tuberculosis H37Ra excretory-secretory ES-43 and ES-31 antigens at different stages of pulmonary tuberculosis, Biomed Res 2004; 15: 76- 79. .Banerjee S, Nair E R, Kumar S, Reddy MVR, Harinath B C. Assay of tubercular antibody, circulating free and immune complexed antigen in the diagnosis of pulmonary tuberculosis. Ind J Clin Biochem 2001:16:132-135. Harinath B C, Kumar S, Roy S S, Hirudkar S, Upadhye V, Shende N. A coctail of affinity purified antibodies reactive with diagnostically useful mycobacterial antigens ES-31, ES-43 and EST-6 for detecting the presence of Mycobacterium tuberculosis. Diag Microbio Inf Dis 2006; 55:65-68. Shende N, Gupta S, Bhatia AS, Kumar S, Harinath BC. Detection of free and immune complexed serine protease and its antibody in patients of tuberculosis with and without HIV co-infection. Int J Tuberc Lung Dis 2005; 9 (8): 915-919. Gupta S, Kumar S, Harinath BC. Mycobacterium Tuberculosis Excretory Secretory (ES) protein antigens of interest in Diagnosis,Prognosis and Prediction of Disease Development.J MGIMS 2004; 9(ii): 16-21. Saha-Roy S, Shende N, Kumar S, Harinath BC. Effectivity of crude verss purified mycobacterial secretory protein as immunogen for optimum antibody production. Ind J Exp Biol 2005; 43: 1196-1198. Prasad GBKS, Kharat I, Harinath BC. Detection of antimicrofilarial ES antigen –antibody in immune complexes in bancroftian filariasis by enzyme immunoassay. Trans R Soc Trop Med Hyg 1983; 77: 771-772. Singh KK, Dong Y, Patibandlu SA, Mc Murray DN, Arora V, Lal S. Immunogenicity of mycobacterial tuberculosis PPE55(Rv3347c) protein during incipient and clinical tuberculosis. Infect Immun 2005; 73(8): 5004-5014. Shende N, Gupta S, Kumar S, Harinath BC. Levels of antibody, free antigen and immune-complexed antigen by ELISA in different grades of sputum positive patients of pulmonary tuberculosis. Ind J Pathol Microbiol 2004; 47(3): 438-440. Sauar NJ, Foulkes JA, O’Neil PM. A comparison of alkaline phosphatase, beta galactosidase, penicillinase and Peroxidase used as labels for progesterone determination in milk by heterogenous microtitre plate. Enzyme immunoassay. JSteroid Biochm 1989; 33; 423-426. Reddy MVR, Alli R, Devi KK, Narayan R, Harikishnan R, Cheirmaraj K, Harinath BC. Comparative evaluation of microtitre plate Peroxidase and penicillinase enzyme immunoassay for detection of filarial antibodies using Brugia malayi Microfilarial excretory-secretory antigen. J Parasitic Dis 1996; 20: 173-176.